Dr. Farley has been a Godsend. After struggling pretty much since birth with psychological issues going from doctor to doctor, psychologist, psychiatrist, behavioral therapist, naturopath, chiropractor, hypnotherapists, etc. I could no longer take the chaos and realized that I needed to find someone who could actually help and get to the root cause of where all of this anxiety was coming from. 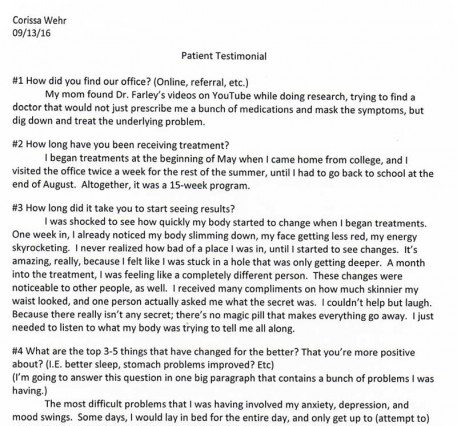 After researching online, the first Doctor I had found was Dr. Farley and it was actually an ad which seemed like a sign since it was the first Doctor that had popped up with a testimonial that sounded like issues I had been dealing with as well. I decided to take the leap and am so glad that I did. I have finally found the root cause which countless numbers of doctors were unable to find. After finally realizing that my issues were not psychological at all and I actually had an issue that could be fixed was honestly the biggest relief. Working with Dr. Farley has been great and most of my issues have been addressed. Dr. Farley never gives up and continues to keep working on each issue until you are able to find some ease. His staff is amazing, so sweet and kind and honestly make you feel as if you are one of the family. This is the first time that I have been able to see noticeable progress and I am so thankful to be able to start living the life that I have always wanted uninterrupted by the bouts of intense anxiety. Not only was Dr. Farley able to help me physically, but mentally as well. He was able to direct me to CD’s and Videos on changing beliefs and setting goals, building up of mental toughness and overall great life lessons. I am extremely thankful for Dr. Farley and his staff and would definitely recommend him 110%. His passion for helping people and teaching along the way is admirable and his dedication is steadfast. He will do whatever it takes to get you well and is truly one-of-a-kind. You’re suffering and you need a different approach or you would not be reading this! You are not being heard. Your gut instinct knows something else is wrong. You must be willing to give up who you are, and what you have done, in order to regain your health. We have put information together for depression, anxiety and bipolar on one page because we are NOT treating any disease. Neuro Biomedicine views these manifestations from a BIOLOGICAL PSYCHOLOGY perspective.. Therefore we need to not look at the pathological name and classify everything as neuro transmitter deficiency that needs to be treated with a drug. If you qualify, we personalize a Neuro Biomedicine Plan to identify your unique root functional cause(s) for the symptoms you are having. This approach is scientific and bottom line usually produces results in 2-4 weeks. Over 90% of the patients we have helped have depression, anxiety or bipolar as one of their top 3-5 presenting complaints. These are very, very common problems. The actual diagnosis itself is extremely subjective. One doctor will listen and tell a patient they have diagnosis A, while another doctor will say B or C. The reason for such inaccurate findings is that the only driving factor for such diagnosis is based on symptoms and symptoms can change like the wind. We base our recommendations not on a pathological name but on improper physiological parameters. Genetic Family History – In all diagnosis physical or mental there HAS NOT been a huge amount of evidence that the genes are the problem. The genetic theory of disease was disproven by the human genome project. As per Dr. Bruce Lipton (molecular biologist) only 5% of all diseases are genetically based. You are not doomed because of your family history! The brain can malfunction from real biological dysfunction and it can then demonstrate as behavioral, psychological or physical symptoms. Many patients we have helped did not have psychological problems but rather BIOLOGICAL DYSFUNCTION. We help identify and correct your root functional causes to restore this biological dysfunction. If medications have worked for you, it can help in identifying your root functional causes. If medication has not worked, then you really need an approach to identify all of your root functional causes to lessen your suffering and get back on track. The interaction of your foods and your brain function are well established in the scientific literature. If you have not had this mentioned by your doctor, you need to find a new doctor. You need to uncover your root functional causes if you are ever to get well. Symptom management is not health restoration, and without health restoration you will forever struggle, suffer and have multiple relapses with decline and deterioration as the end result. 2. Genetics play a minimal role even if you have a family history. 3. The chemical imbalance theory that requires drugs is not scientific nor proven. Psychiatric drugs have often been prescribed to patients on the basis that they cure a ‘chemical imbalance’. However, no chemical imbalances have been proven to exist in relation to any mental health disorder. There is also no method available to test for the presence or absence of these chemical imbalances. View a PDF summary of the research supporting this unrecognized fact. 4. Patients must take 100% responsibility for their life, their health, and the good/bad choices that they make. We work with all doctors. We can help develop a true healthcare plan to restore normal function. Only when we restore normal function can you begin to get out of the mud, begin to move forward and get your life and your relationships back on track. Stop being mismanaged and begin to feel how getting well can actually happen, but only when we find, correct and allow your mind and body to function properly. As Dr. M. Scott Peck stated “Life is Difficult” so let’s take responsibility, learn how your brains work, and stop giving power to the negative thoughts that people, situations or experiences have created your condition. Let’s start focusing on true mental health care. This is cortical rewiring and remapping of your brain into a positive mindset through neuroplasticity. This is a BIG shift…but isn’t that what you need or do you want to continue to swim in the muck and mud of theories? Are you ready for the shift?